Congratulations to all of our Conservative Councillors who have been elected in Barnet at the recent elections. We bucked the trend in London and the blue flag is still flying high! We are especially happy to see such a huge endorsement for Mike. Of the three Barnet Constituencies, the results in Finchley and Golders Green were fantastic for us. Ours was the only constituency in the borough where we gained seats, at the expense of the hapless LibDums! Sadly we couldn't get rid of the last one, missing out by nine votes in Childs Hill! Mike said after the results were declared. Yet again Mike has made a huge difference with his tireless campaigning and hard work. 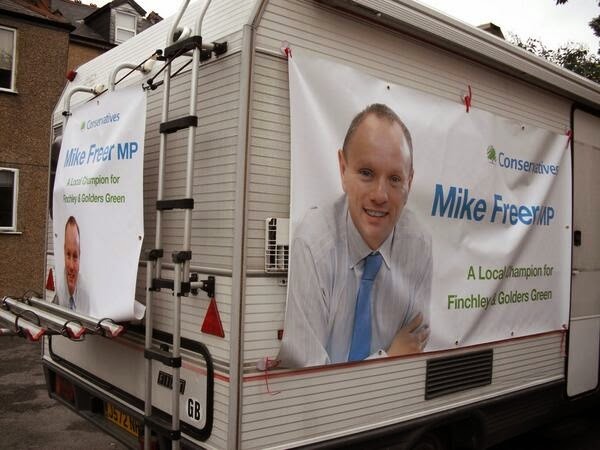 Yet again the people of Finchley and Golders Green have shown they like what Mike is doing. It shows what happens when you have an MP who is prepared to roll up his sleeves and put the elbow grease in! Mike put a huge amount of personal effort into the campaign! This work paid handsome dividends and ensures that we are still running the town hall!!! Roll on the general election in 2015. Does the government now have sufficient power over the banks, such that they can now be allowed to fail, if necessary? Are the banks now stopped from the sort of recklessness, that the state would have to bail them out again? The BoE Governor seems to think not.